Teaching multiplication properties to 8 year olds is HARD! With state testing coming up - I really wanted to make sure my students could identify the differences between the five properties. I made this coloring sheet for my students to really understand the definitions of the properties and applying them to math equations of what each property looks like. For example - The associative property states that the grouping of the factors can be different, but the product will be the same. So we discussed the placement of the factors, how the parenthesis group the factors and how both sides of the equations equal the same thing. Have fun! 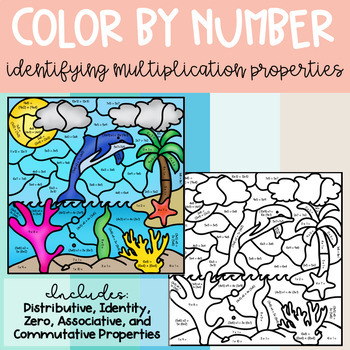 This resource is free and hopefully with this practice, your students can really differentiation what the multiplication properties look like in multiplication equations.